Yé-yé is having a banner year, or at least the biggest year it’s probably had in a long time, in that at least a few dozen more people were introduced to the style of 1960s and ‘70s French pop piloted by songwriters like Serge Gainsbourg and the catchy, double entendre-packed numbers performed by young stars like Gainsbourg’s protégé, France Gall, through brief pop culture instances. As Megan Calvet-Draper, Jessica Paré introduced the men of Sterling Cooper Draper Pryce (and, by proxy, some American television viewers) to the genre with her earworm rendition of Gillian Hills’ “Zou Bisou Bisou” on Mad Men. One of the most memorable scenes in Wes Anderson’s Moonrise Kingdom features two runaway kids dancing frantically on a beach to Françoise Hardy’s “Le temps de l’amour.” So it’s as good of a time as any for the world to be reacquainted with one of the architects of the sound and so much more, Serge Gainsbourg, and making the introduction is his son, Lucien “Lulu” Gainsbourg, who has rerecorded some of his father’s best-known songs with the help of a cross-genre cast of characters. When looking at a covers album, there’s always going to be the matter of weighing everything against the original, a task made all the more interesting here by the fact that this is a musician son paying tribute to his father. And based on the collection of musicians and other stars he’s assembled for this project—Iggy Pop! Marianne Faithfull! Johnny Depp—a whole lot of qualified people believe in it, too. And most of the entries are solid, on their own and in terms of Gainsbourg covers—Johnny Depp & Vanessa Paradis’ dark and stormy “Ballade De Melody Nelson”; a nimble “Le Poinçonneur Des Lilas” with Angelo Debarre—but as with any covers collection, not every selection is perfect. Some celebrity appearances are less concerned with recreating Serge Gainsbourg’s vision exactly, albeit to mixed results. Rufus Wainwright’s take on “Je Suis Venu Te Dire Que Je M’en Vas” places Serge Gainsbourg’s heartbreaker into his comfort zone of gliding choruses and pianos. Although Wainwright’s version is quite beautiful, both in context and on its own, and captures the longing of Gainsbourg the Elder’s original, it lacks the feeling of crushing defeat and vulnerability—here, the final third yields weeping violins in lieu of the actual sound of sobbing that punctuates Serge Gainsbourg’s version, still a sock to the gut every time you hear it. One of the most dramatic shifts occurs with the dark and loungey “Sous Le Soleil Exactement,” for which Lulu Gainsbourg enlists the help of Pogues frontman Shane MacGowan. MacGowan’s slurring and the gentle skipping of a mandolin throughout feel at home here as they would in any Pogues song, and the swaying rhythm gives the whole thing the feel of a scene in an American-made movie of a boozy sing-along in a Parisian café. And how does Lulu fare on his own, sans the backing of a Johansson or a Wainwright? Even though you’re rooting for him, not quite as well. 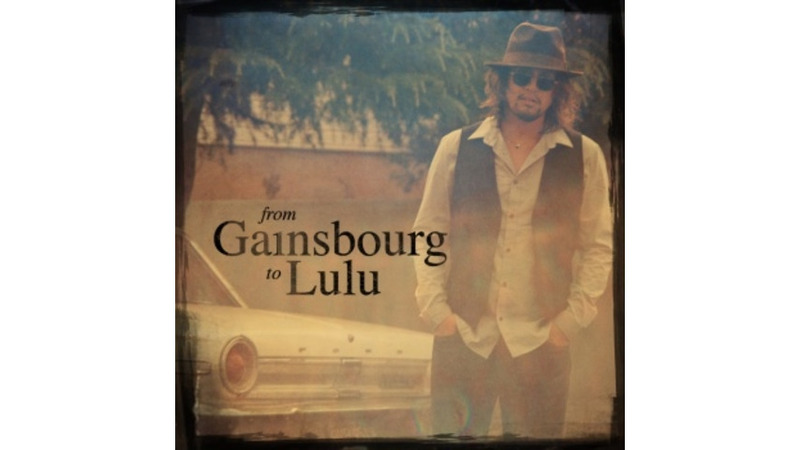 A jazz musician by trade, Lulu Gainsbourg can certainly play, and play well, and some of his instrumental-heavy selections are nice to listen to, but the rest feels like a wedding cocktail hour as opposed to a proper tribute to his fiery, freaky father. But even if not every track is perfect, and a few not particularly memorable (especially without the help from his friends), it’s an album you can tell was made with admiration for Serge Gainsbourg at its core, and the sort of admiration shown from son to father.